ACCOMPANYING the 2004 issue of George Pelecanos’ stand out novel, Hard Revolution, was a CD of classic soul music, the music of 1968 as Washington and a host of other predominantly black cities burned amid the riots which followed the murder of Dr Martin Luther King. It may have been a straight forward attempt at joining the multi-media age of cross platform marketing which typified much of the early 2000s, but it highlights the centrality of music to Pelecanos’ 16 novels. The link between social events, either grand or small, and music is one of the key characteristics of Pelecanos’ work. Get this straight, Pelecanos uses music in the way that great crime writers do: to illustrate a key facet of the time or of a key character’s psyche. Some writers have been accused of shoe horning in hip music, and even the best do sometimes cloyingly throw in classics. It becomes easy to spot. But, like Ian Rankin’s Inspector Rebus and his love of prog and dour 70s folk rock and Henning Mankell’s Kurt Wallander and his deep attachment to opera, Pelecanos’ characters are defined by the centrality of music to their lives. Music is in their background, just as Wallander a former classical hopeful, has the music in his DNA. In Pelecanos, music touches everyone as it plays on Washingon DC FM stations frequently name checked in the car journeys and diners of the stories. Songs and artists literally bleed through into the prose setting the background to the plot devices making them seem more authentic. Just as it does in such an unobtrusive way in the unfolding narrative of The Wire. 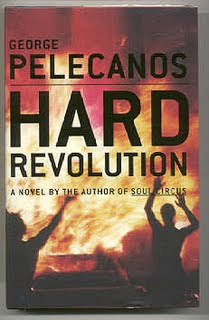 In his Pelecanos’ first novel, A Firing Offence, Nick Stefanos a former punk kid who works as a marketing manager for an electrical outlet (like Pelecanos once did), takes his alcohol loving friends to a series of bars playing Camper Van Beethoven in the car while The Cure’s saxophone solo and The Pogues join up along the way on a bar crawl. There is a vividness in what this music evokes in its time and atmosphere. In a throwaway paragraph at the start of a chapter in Right as Rain, perhaps the best book of his Derek Strange/ Terry Quinn series, Pelecanos’ choice of music signifies the genre he works in. It’s not simply crime or thriller but an updating of the much maligned western genre, Strange checks his stocks listening to Elmer Bernstein’s soundtrack to The Magnificent Seven. It’s a tellingly minute and hugely important moment in the novelist’s career. In another Quinn Strange novel, Hell to Pay, the former character is reading James Carlos Blake’s hardboiled western book The Pistoleer, the clues are all there for anyone interested. But we have to return to Hard Revolution to see the complex interplay between music, society and the personal motivations of key characters at its best. Early on, Strange’s brother Dennis and his drug buddy Kenneth Willis cruise high on reefer and listening to classic soul. Dennis, tortured by his addictions and heading towards the radicalism of the Nation of Islam (through his reading of black awareness books like The Colonizer and the Colonized and The Wretched of the Earth), and Willis listen to Percy Sledge. Dennis has no truck with this old soul, preferring the proto funk of Sly Stone and The Chambers Brothers, who represent a new kind of blackness. For Dennis, the old time night clubishness of Sledge is tantamount to Uncle Tom-ism, he represents the black past, Sly is a radical new future. Music represents both the future and its tussle with the old. The interplay between character, class and social change and the relationship with the music of the time is hugely important in Hard Revolution. In Pelecanos’ fiction music has the power to represent characters’ essences and evoke all eras of our time in way that few other authors ever achieve. Dominic West: What the... I do? GMs most pertinent blog of its short history?